John R. DeAngelis is the founder of DeAngelis, Dastur & Associates. A graduate of Central Catholic High School, he then received a B.A. in Political Science from the University of Dayton in 1968 and graduated from Duquesne University School of Law in 1972. John DeAngelis had previously been associated with Union National Bank and the firms of Watzman, Levinson & Snyder; Watzman, DeAngelis & Elovitz; and Lewis, Stockey & DeAngelis wherein he became a Partner in 1980. 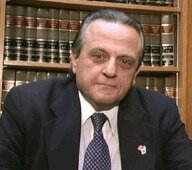 Mr. DeAngelis founded DeAngelis, Dastur & Associates in 1981 as John R. DeAngelis & Associates. He served as Senior Partner until 2004, when he retired. Attorney DeAngelis had also been a part-time faculty member of the Community College of Allegheny County, teaching in the field of Labor Relations, as well as having the distinction of being elected to the Office of District Justice, PA Minor Judiciary from 1982 through 1988 in the Tenth and Eleventh Wards of the City of Pittsburgh. Mr. DeAngelis passed away in 2012.